The kid G4SHI is back with a fresh new set of visuals for a track on which he lets all his homies know that he plans to fulfill his quest for success all by his lonesome. He’ll be accepting “No Favors” along the way. Frequent collaborator Myles William laid down the beat for this one. Check out the Larry Gashi and Jawney Quest-directed video after the jump, and for more on G4SHI, take a look at our exclusive interview with the kid here. G4shi delivers a brand new music video for “Who Made Me”. Produced by Smokie Morrison and directed by Larry Gashi, Team G4SHI & Jawney Quest. If you don’t know about G4shi yet check out our exclusive interview with him. 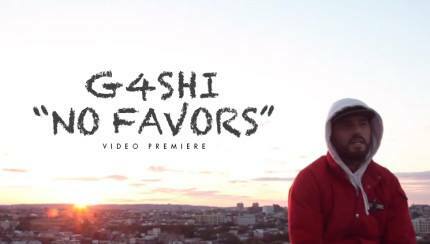 Brooklyn rapper G4SHI comes through with a new visual, MFSO, off his upcoming mixtape. Directed and Edited by Eightsixfourth. If you’re only discovering G4shi now check out our exclusive interview here for his background and to find out more. Upcoming NYC based rapper G4shi drops a new video called “Lanas Song”. Filmed by 86th 1/4th Collective. If you don’t know about G4shi yet, check out our exclusive video interview with him. G4SHI delivers another visual for a track that will be coming off his upcoming mixtape project. The title of this record is “Beautiful World”. G4SHI goes in about how beautiful life is and the struggles about chasing your dreams.